Bono is alive! Not only that, he's up and moving around, as can be seen in a new video the band themselves shot and posted on their website today, following yesterday's announcement of their rescheduled North American dates (including the TCF Bank Stadium show, now July 23, 2011). The video features all four members talking about their appreciation to fans for sticking by them amid the cancellations. 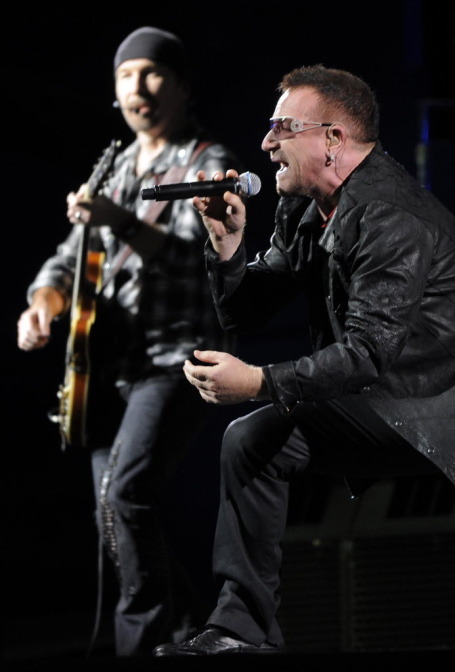 The Edge and Adam Clayton also joke about trying to find another singer while Bono was laid up. I have to say, I thought this was a pretty cool and charming thing for the Irish lads to do. A press release saying you're sorry is one thing, and this is clearly another. "People went to a lot of trouble to get U2 tickets, and we don't take that for granted," Bono said. See you next summer, dude. Click here to see the video on the band's site.